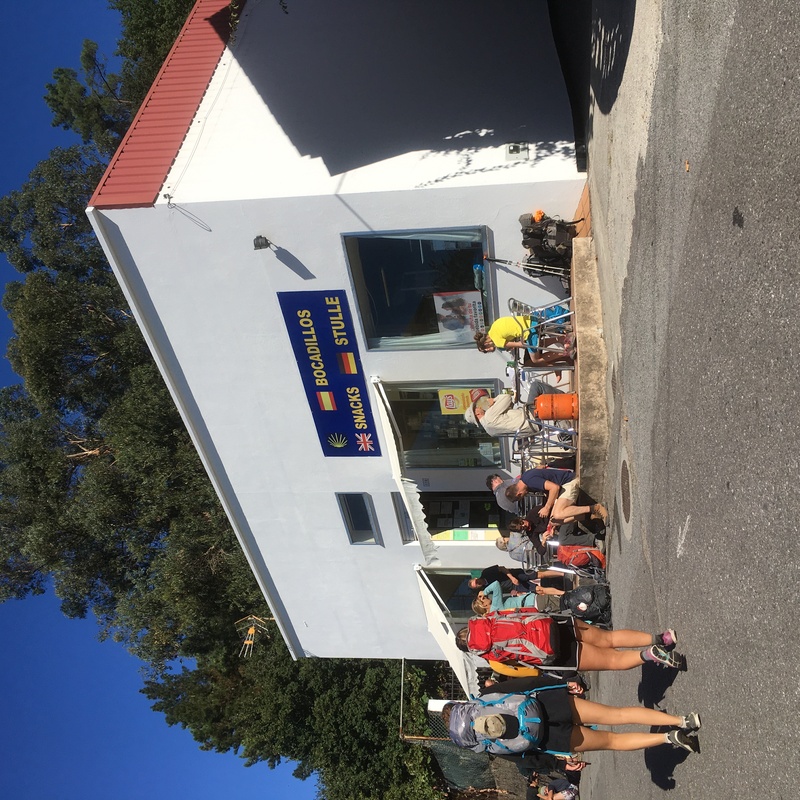 Camino de Santiago – tourist trap or spiritual path? We start early, woken by the keen energy of other Camino pilgrims and greeted outside by a star, falling through crisp, dark sky. Since we began our walk, the moon has waned from a full, bright round to craggy quarter. A dirt road takes us around lanes, between village homes still quiet with sleep, until we reach an intersection where a highway, already busy at this early hour, leads us precariously onward. Spooked by huge trucks passing at fierce speed, we’re relieved to see the beckoning lights of a cafe, countertop replete with warm empanadas, fresh croissants and an almond cake named for Saint Santiago. As we offer our credential booklets for the pligrim’s stamp I wonder, are cafes the new churches? Although there is some sadness in this being the final section in our Camino Way, my feet will be glad to finish. These past few days, I’ve been walking with the assistance of efficient painkillers that I’m pretty sure were not available to the first pilgrims in mediaeval times. Blisters upon blisters upon blisters. Ouch. I blame the asphalt roads – hard and unyielding to human feet. There are too many of these for me. I prefer the quiet of forests which, being full of eucalypts, are achingly reminiscent of our time in the forests of Tasmania. 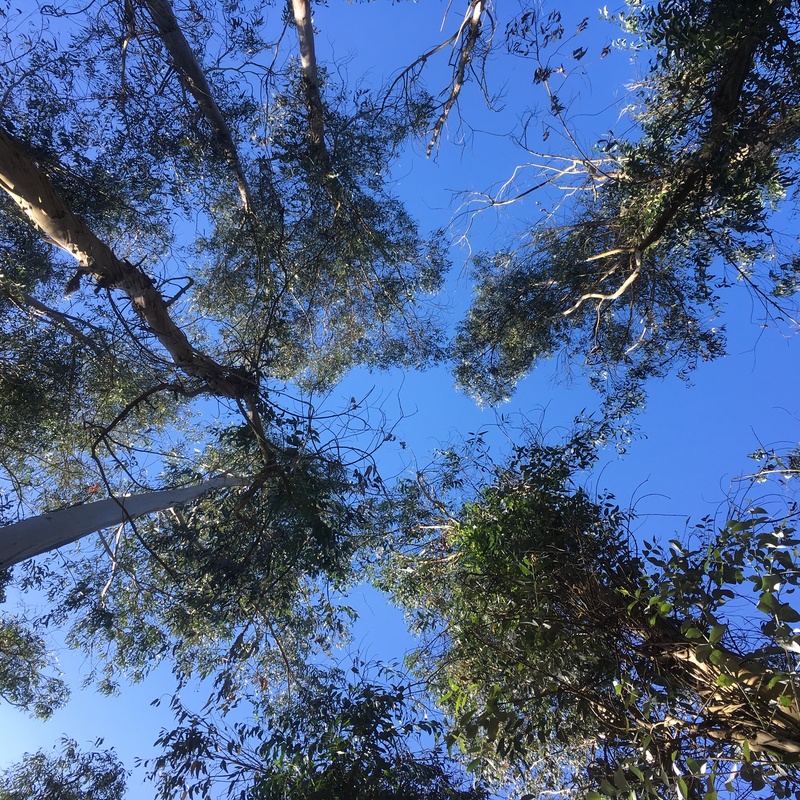 Imported to control erosion and as fast-growing timber, eucalypts are causing havoc in Portugal, covering up to 7% of the land. As in Australia, they make great fuel for forest fires, and as climate change ramps up the summer temperatures, both these countries are re-considering how to manage these magnificent trees. Stepping aside from the path, we lie down on dry, sweet-smelling leaf litter and gaze up through the cathedral of trees to a denim blue patch of sky. After a scramble for beds at the auberge on the first two days, we took the decision from then on to book ahead and skip the stress. After all, what Way does not include time to stand and stare? In addition to soulful wayside dreamings, my companions and I make time for daily reflections. These practices add richness and meaningfulness to our journey – an inner element to weave alongside the outer scenery. During the tough bits, I plugged one ear into my i-pod and listened to The Good People by Hannah Kent. Kent iridescently imagines rural Ireland in the 1800s when the local “doctress” – a local medicine woman – finds her ‘old ways’ outlawed by the church. Treading these ancient Galician pathways graced with autumn fruits and nuts, elderberries, blackberries and hedgerow mint, I am reminded how the land holds so many cures for our ills and how women were mostly the ones who held the knowledge of how to use them. It was a male-dominated clergy who helped push them out and a patriarchal university system which monopolised the medical profession to which women – no matter how skilled or priviliged – were not admitted. What was I doing then, walking along a Christian pilgrim route? And amongst the masculine icons, where were the peregrinas – the symbols of female power? 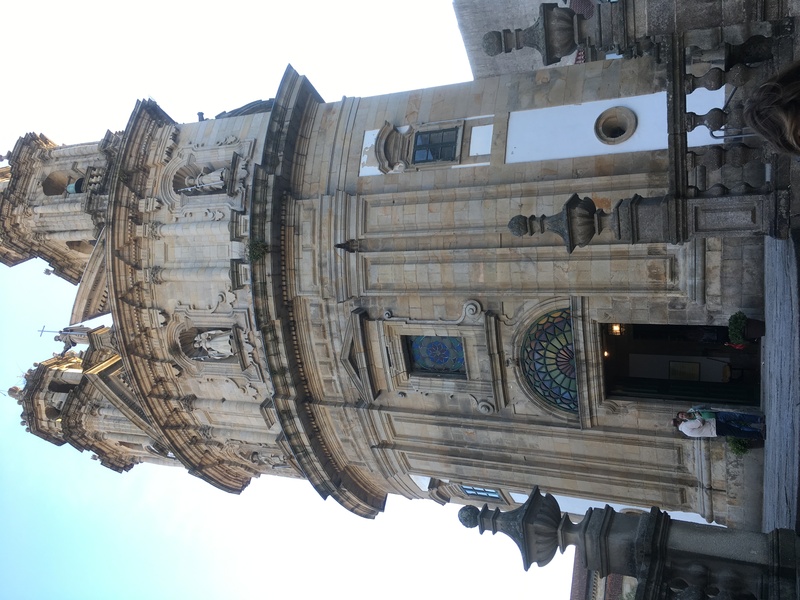 I sit quietly in a wayside chapel to contemplate this, but am interrupted by a babble of pilgrims, bustling into the chapel to take pictures and gather a stamp for their Camino credencial. Once again I question – what am I doing here, hoping for a spiritual experience at a time when the spiritual path has been replaced by the route to the next coffee shop? The following morning, we arrive in Pontevedra, its ancient town centre now lauded for extensive pedestrianisation. Walking the quiet streets, we are drawn into a rounded church where, to my surprise, the image of a woman gazes down at us from the vestry. The frieze above her depicts a donkey on which rides a pregnant woman. In this way, the elegant Capela da Virxe Peregrina seems to answer my question. During the final three days, I ask my social media community to help me find purpose in my walk. “Walk for all those who can’t”, one says. “For equality and justice.” “For love”. “For justice for refugees.” “For the Earth.” Walking with these prayers in mind, a warmth spreads through my heart and for a while, I am able to forget my own sore feet.